Frontiers Records (www.frontiers.it) proudly announces the release of PRIMAL FEAR new studio album 16.6 (Before the Devil Knows You’re Dead) on May 22nd in Europe and June 9th in the USA. Anticipated by a successful listening session held in Cologne, Germany, attended by the cream of the European Metal press, the new album is about to bring back Primal Fear to the throne of Heavy Metal. 16.6 is easily the most powerful, ambitious and interesting album in the band’s history. The vibe of songs like the opening track “Riding The Eagle”, “Killbound” or “Under The Radar” are reminiscent of the “Nuclear Fire” album but eh whole album features all the trademarks of the Primal Fear sound a the total dedication to pure Metal. There is also a new approach mixed with the trademark PF riffs in tracks like “Six Times Dead (16.6)”, “Soar”, “Smith & Wesson” as well as the epic stories, consummate musicianship, courage and fantastic melodies in songs like “Black Rain”, “No Smoke Without Fire”, “Torn” and the stylistically new ballad “Hands Of Time” with 4 band members all sharing the lead-vocals. The album was recorded the House Of Music studios with engineer Dennis Ward, mixing engineer Achim Koehler and producer Mat Sinner. Once again Primal Fear display a very high standard of song writing, sound and production. New guitarist Magnus Karlsson and Henny Wolter shine with a new dimension to the guitar work, and lead vocalist Ralf Scheepers reaches a new level to his vocal performances. 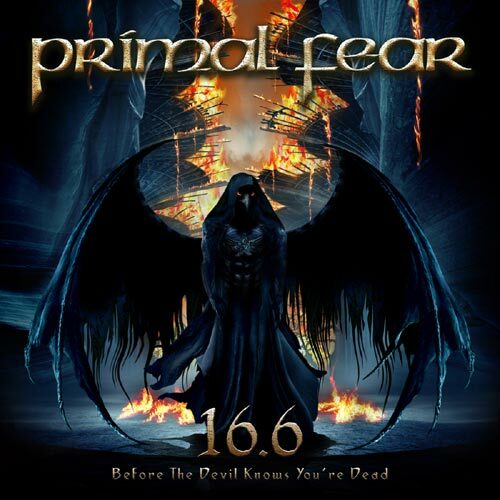 Nothing can go wrong if you’re backed by one of the best rhythm sections in metal with Randy Black and Mat Sinner and you can hear the result on Primal Fear’s outstanding new message called 16.6! After the Primal Fear / Sinner show in Moscow on April 4th, the band will appear in Norway on April 25th at the Haugesund Festival and in some summer Festivals. More shows are being booked in South America (with Sinner), USA incl. PPX and more dates early next year, with Europe kicking off at the end of September (with Brainstorm). More news soon !